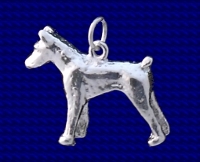 Sterling silver Doberman charm. The Doberman Pinscher was originally developed around 1890 by Karl Friedrich Louis Dobermann, who cross bred a large number of breeds to get the attributes he required. They are are one the most common of pet breeds, it is intelligent, alert, and loyal. The Doberman has been much used by police forces and as a guard dog. 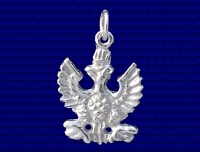 Craftsman made Sterling silver Doberman charm.